Just recently there was a special program in the Basque town of Zumaia to remember a tragic event. 80 years ago, 252 citizens of this little town (even smaller back then) were forcibly expelled from Zumaia by pro-Franco (the past dictator of Spain) supporters. This group of mainly women and small children were awakened one winter’s night and told to leave town with what they could pack into one bag. 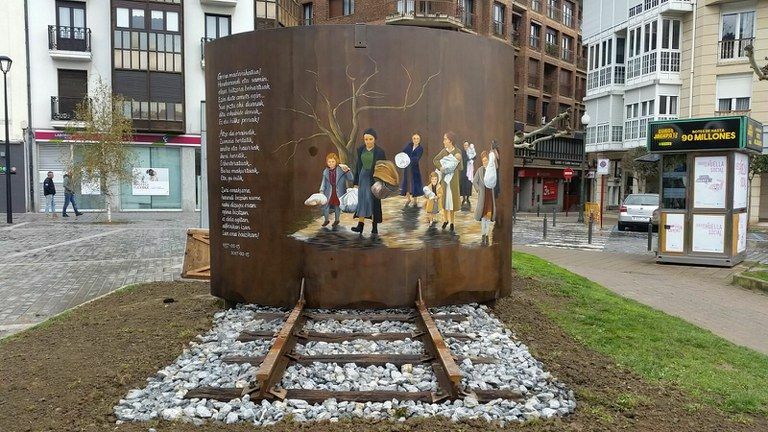 There were a total of “almost” 750 people expelled throughout Gipuzkoa, from at least 12 other towns, but Zumaia had the largest number and now holds the mural above which shows the tragedy. After having lived here all these years, I never cease to be amazed at all the different surprises like this one that come up. Unresolved social justice issues is one of the four principal reasons why spiritual darkness continues to hover where it does throughout the world. It is no surprise that this corner of the world continues to be a dark place! There is a website on the Zumaia town hall website with a list of the people who were exported. Today please pray for forgiveness and reconciliation that can only come from God.